Plan B Games is a new publisher with a strong pedigree, as its founder, Sophie Gravel, previously started filosofia Éditions, which grew into the umbrella company F2Z Entertainment as Gravel added Z-Man Games and Plaid Hat to their portfolio. Asmodee acquired F2Z in the summer of 2016, while Gravel left with a few members of her core team to start a new company, Plan B. The imprint’s first release, Century: Spice Road, was a hit at the Origins Game Fair this summer, a light to medium-weight game with a Near East theme and some mechanical similarities to Splendor. Their second title, Michael Kiesling’s Azul, is stronger across the board, a tile placement game that requires you to engage in a little game theory to get the tiles you want and avoid the ones you don’t, with quick playing times and stunning artwork. Kiesling has many titles under his belt already, including the Spiel des Jahres-winning Torres (just back in print this year from IDW after years in purgatory) and personal favorite Vikings, which came out in 2007 and has appeared in the top 50 of my own all-time boardgame rankings ever since. 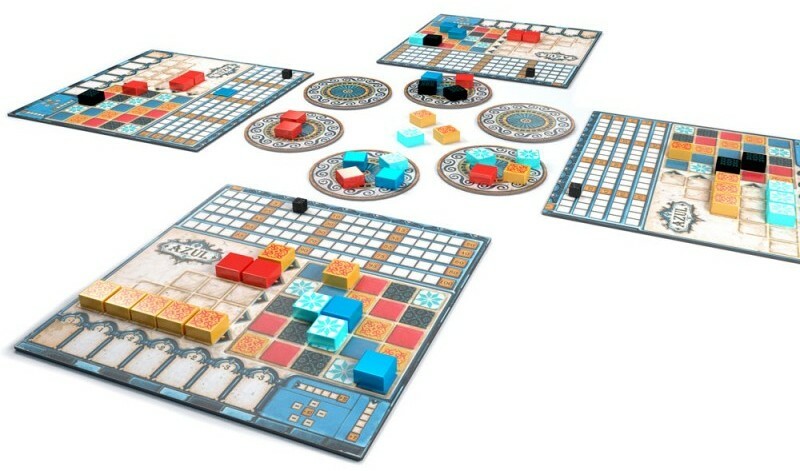 Azul presents a step up for him in look and feel—the graphics for this game, resembling the mosaic tiles of Moorish architecture, are vibrant and memorable, and the tiles themselves are heavy plastic—with a selection mechanic that reminds me of those of Vikings and Asara (another of Kiesling’s titles), where all players select from a central pool but must plan out their selections to set themselves up for future turns and to try to prevent opponents from getting just what they need. 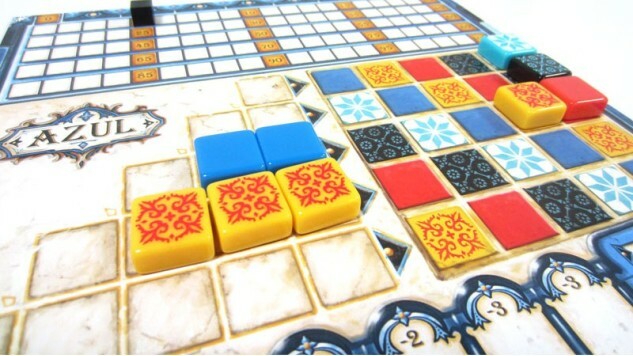 In Azul, two to four players try to fill out as much of their personal 5×5 tile boards as possible before the game ends when one player finishes an entire row on his/her board. The tiles come in five colors, and each player board has the same preprinted pattern on the 5×5 area, which means you can’t put two tiles of the same color in any row or in any column. The catch is how you get the tiles from table to board. At the beginning of each round, the dealer places four tiles, drawn randomly from a stylish bag, on each of five to nine “offering” circles (five for two players, nine for four). The start player then takes all tiles of one color from any of the circles, pushing any leftover tiles into the center of the table. Subsequent players may take all tiles of one color from another circle, or may take all tiles of one color from the center; the first player to take tiles from the center becomes the next round’s start player, but will also lose one point at the end of the current round. Once you’ve taken tiles from a circle or the center, you place them on the left side of your board, which has five blank rows, with one to five empty spaces from top to bottom. You can place the tiles you’ve taken into an empty row, as long as you haven’t already placed a tile of that color in the corresponding row on your 5×5 grid, or can continue to fill a row that already has tiles of the same color. Once you fill the row on the left, any remaining tiles in your hand from that draw must go on the “floor,” a row of spaces at the bottom of your board that carry penalties at the end of the round—one point for each of the first two tiles, two points for each of the next two, and so on. On your turn, you can only place tiles you’ve drawn into one row; you can’t distribute them across multiple rows, even if those rows already have tiles of that color. When the round ends, each player can move one tile from any completed row on the left into the grid on the right. Remaining tiles go back into the game box and will eventually return to the bag when the supply is exhausted. Any incomplete rows remain as is for the next round. You score at least one point per tile moved to the 5×5 grid, but if you place a tile adjacent to any other tiles, you can score more points for it, up to ten for a single placement. If the tile is horizontally adjacent to any tiles, you score one point per tile in the new row. If the tile is vertically adjacent to any tiles, you score one point per tile in the new column. If the tile is adjacent in both directions, you score twice for it—so placing a tile in a space that completes a row and column simultaneously scores you ten points, five for the column and five for the row. If you’ve followed my explanation, you might see where the game theory aspect of Azul comes into play. Aside from your first draw of a round, you probably won’t get enough tiles to complete a row on the left side of your board, and you want to avoid a situation where you’ll be forced at the end of a round to take a bunch of tiles you can’t play, which can result in penalties that wipe out your gains for the entire round. Players must then think ahead about how to work the tile draws in their favor, perhaps making the center piles more or less attractive to others, and consider how to manipulate the draws so that they don’t get stuck at the end of the round—unless they get stuck with, say, the five tiles they wanted for the bottom row. Azul plays very differently with more players, primarily because the piles at the end of a round can be much bigger when the round starts with 28 or 36 tiles rather than 20. With two players, it’s a bit easier to forecast the next few draws, and you’ll often know later in the game that certain tiles are safe because your opponent can’t place them at all. With three and especially four players, you need to have a disaster preparedness plan for when you’re up last and the center of the table contains nothing but eight red tiles. The theme doesn’t really tie into or matter for the game play, but the artwork is just fantastic and I think will give Azul a ton of shelf appeal in a market where maybe publishers don’t pay as much attention to that aspect of marketing. I did have one concern about Azul’s visuals: Of the five tile colors, only three have patterns, which might present an issue for color-blind or visually impaired players. It’s still one of the best new games I’ve played this year.